Howey-in-the-Hills, FL, March 15, 2018	(Newswire.com) - ​International keynote speaker, award-winning author, and emerging trends and technologies consultant Simon J. Anderson will share his insights on the near-future possibilities for the heating, cooling, and refrigeration industry at the 2018 CE Florida Factory Authorized Dealer Meeting in Howey-in-the-Hills, FL on April 5th. In his closing keynote presentation, Anderson will bring attention to how emerging trends and new technological advancements are creating exciting opportunities for those working in the HVAC industry, but might also present some unexpected challenges. For example, how are "Digital Natives" (those raised with the internet and mobile devices) changing how we buy and sell? How can Carrier and Bryant dealers keep up with the ever-expanding number of smart home devices and sensors? Anderson will address these questions and more as he explores future possibilities and opportunities, as well as new approaches to see the future from a different perspective. Anderson says: "The HVAC industry is being transformed by exponential advancements in technology, and every one of our lives will be impacted by the changes these technologies bring. My role as a futurist is to a help industry leaders recognize opportunities created by these advancements and take action to not just survive, but to thrive in our fast-changing future." The HVAC industry is being transformed by exponential advancements in technology, and every one of our lives will be impacted by the changes these technologies bring. My role as a futurist is to a help industry leaders recognize opportunities created by these advancements and take action to not just survive, but to thrive in our fast-changing future. Specific trends and technologies to be addressed include how recent advancements in artificial intelligence-powered automation could increase efficiency and reduce costs; how new augmented reality devices can vastly improve training and repair times; new 5G networks and their impact on the internet of things; interconnected smart homes and buildings, emerging blockchain technology and its potential applications to the supply chain and equipment monitoring; and how workplace trends could reshape heating and cooling demands. In addition to Anderson's presentation, the 2018 CE Florida Factory Authorized Dealer Meeting will offer a full day of learning and engagement, and will feature a variety of speakers on dealer-specific topics including new digital tools and new products. As a futurist, Anderson is focused on helping leaders recognize the opportunities created by rapid change. He has shared his compelling message with clients in a wide variety of industries and locations, including a live webinar for executives on five continents for Tata Communications (headquartered in Mumbai), the International Factoring Association, AT&T, the Eastern Maine Development Corporation, the Michigan Banker's Association, the Florida Educational Facilities Planners Association, the Georgia Telecommunications Association, the Maryland Association of Counties, Fidelity Bank in Massachusetts, and Drucker & Falk in Virginia. Anderson's upcoming book, tentatively titled The Future-Ready Professional: How to Create Value In Our Fast-Changing World, is focused on helping individuals compete and win in their careers in a world of increasing automation and a rapidly changing job market. 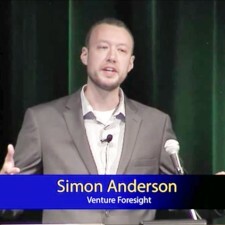 To learn more about Anderson, his book “Foresight 20/20” (ISBN: 978-1592988945), his blog, or his speaking availability, please visit his website at SimonSpeaks.com. Can Your Industry Thrive in Our Fast-Changing Future? 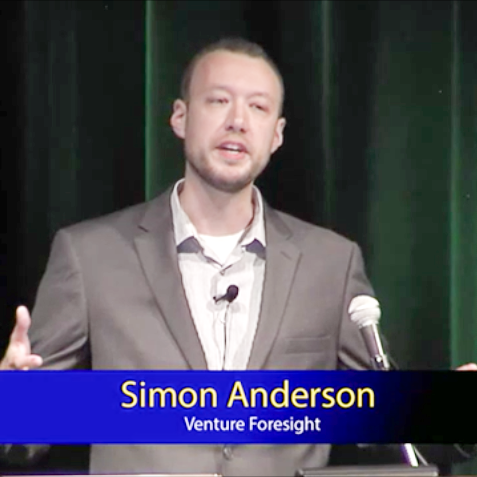 Award-winning author and strategic foresight consultant Simon J. Anderson shared his research and insights at events in four cities and four industries this month.